Most of my favorite Holiday memories involve some form of decorating or baking. I’ve always loved Christmas. I was the kid who would beg to put up the tree starting in October. I made Christmas countdowns and scoured the Sears Wish Book making extravagant and detailed lists of the toys and gadgets that I just had to have. But what I really loved was making Christmas cookies. 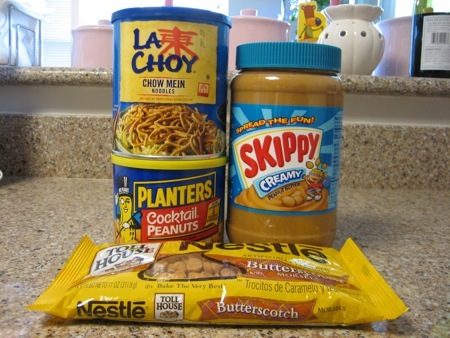 One recipe in particular is a family favorite that will cause the uninitiated snacker’s eyebrows to raise and their brow to furrow. The recipient of this sweet and savory treat will hesitate shyly before taking one from the plate. 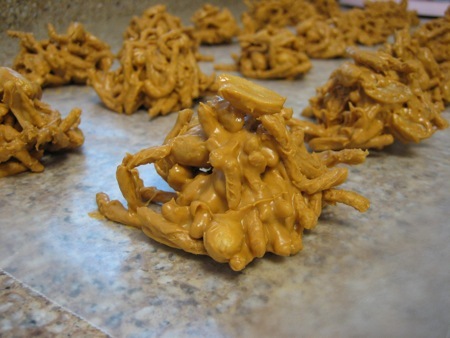 They’ll wonder aloud as to what these strange looking cookies are and maybe even laugh a little when you tell them that they’re Butterscotch Morsels. But eventually they’ll take that first reluctant bite and be hooked for life. The perfect combination of sweet and salty with a pleasing crunchy texture, these quick and ridiculously simple cookies are an excellent treat to whip up for an afternoon snack attack, office party, or hostess gift, and are also great to make with kids since there’s no stove involved. Don’t be scared of the Chinese Noodles! I promise that you’re going to love these. 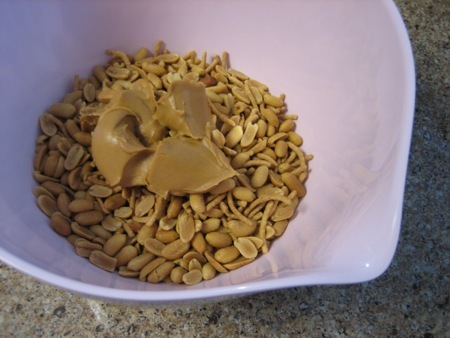 Place the peanuts, noodles, and peanut butter into a large bowl. Melt bits in the microwave for 30 seconds. Stir and repeat 30 second cooking intervals until the bits are melted. 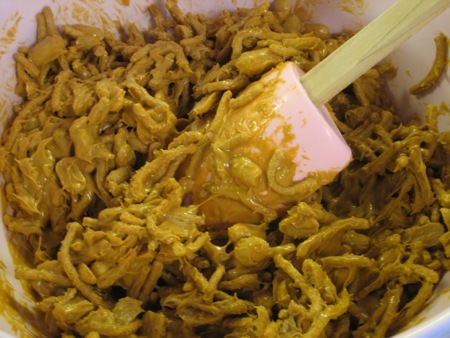 Combine the melted bits with the peanuts, noodles, and peanut butter and stir until everything is coated. 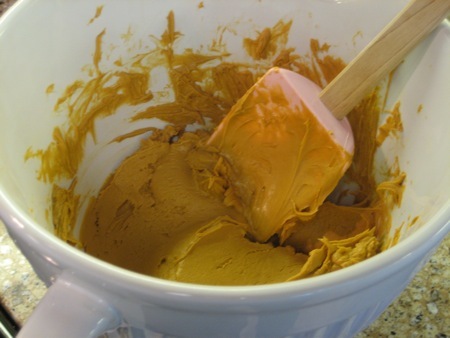 Use an ice cream scoop to shape the cookies and drop them onto the wax paper. Cool until hardened. If using a 1/4 cup scoop you should make approximately 21 cookies. To keep them from getting too soft store the cookies in the refrigerator. i’m wondering if this is the recipe you said no one would believe the secret ingredients? it looks fab. erin after reading about this recipe, i want to kiss you all over. i’m a huge fan of salty and sweet. I’m intrigued. Perhaps when I have a bit more energy (and cut out the 12-14 hour days) I’ll try this for the holidays 🙂 Thanks Erin! Dear Hänni, I expected you to kiss me after I got you drunk on gingerbread cocktails but if all it takes is butterscotch and Chinese noodles then my work here is done. Hi Lys, They literally take maybe 20 minutes to make. I hope when you have some extra time that you get to try them for yourself. They’re super sweet though so have a big glass of milk on standby. You’re missing the marshmallows! 🙂 Try those next time and you’ll be so glad you did! I’ve never made them with marshmallows? Hmm…interesting. Although I don’t know if I could possibly handle any additional sugar. These things give you a toothache. But I do love that you have a cute name for them. Hopscotches is a perfect description.